There was a time I put a lot of effort into the day. Handmade cards, a new dress, a decadent meal, a splurge on a bottle of Champagne. These days, it looks a lot different. I still make something special, and it often includes handmade cards. But there are four of us at the table. I’m luck if I get a dress on and half of the bubbles on the table are made with apple juice. But there is still sparkling wine. This time of year, sparkling wine dominates the beverage refrigerator. Several samples and a couple of bottles that I save for special occasions. If you looked at it this week, you’d find a mix of classic choices and some non-traditional surprises. I have a bottle of Veuve and a bottle of Rollin Soles’ RMS from the Willamette Valley. I have some crémant, prosecco, and had two from Israel. When people think of prosecco, there are a few big players that get most of the attention. But if you want to have a true reflection of what Italian sparkling wine can be, you have to dig a little deeper. 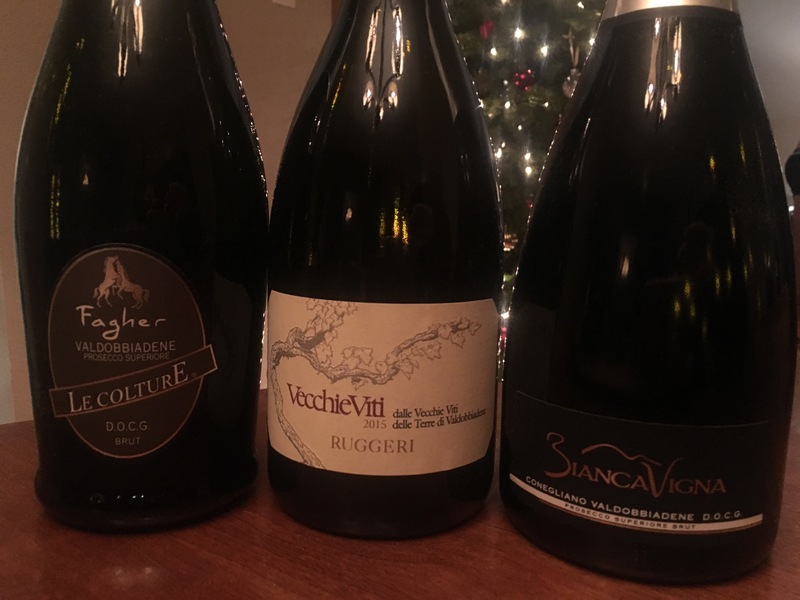 I recently sampled three Prosecco Superiore Conegliano Valdobbiadene DOCG wines. This region, which includes fifteen municipalities, was elevated to DOCG status in 2009. Bianca Vigna is 100% estate grown Glera. The name means “white vineyard” which is reflected in the glass. Pale straw, crisp fresh apple, white flowers. A persistent finish, this wine reminded me of a long bridal train. Fittingly, we opened this to celebrate the engagement of our neighbor. Le Colture Fagher leans toward yellow, While pale in the glass, the wine has notes of golden apple and pear, more bready notes and citrus. Vecchie Viti was the most complex, perhaps because it is from a combination of old vines. It is 90% Glera, the last 10% from three other grapes. Fresh pear, spritely acid, lemon peel, and a creamy brioche finish due to extended time on the lees. Fabulous. Looking for a unique sparkler for you holiday? Golan Height Winery planted their first vineyards in Israel in 1976. They released their first wine in 1984. Since then they have committed themselves to building the fine wine culture in Israel. I recently sampled two sparkling wines from the Yarden series, their flagship label. The 2009 Blanc de Blancs is 100% Chardonnay made in the traditional method. The grapes are whole-cluster pressed and aged for a minimum of four years. This wine reminded me of biscuits and honey. Tropical notes, bready, lemon, minerality and even hints of thyme. We had this with Japanese food and it was delightful. The Rosé was 70% Chardonnay, 30% Pinot Noir with the same production methods. This wine was on the lees for five years yielding a complex and delicious sparkler. Strawberry, fresh rose petals, even a touch of orange oil. A perfect compliment to my daughter’s Chantilly birthday cake. I’d say that the range of wines is a pretty fair reflection of my life these days. It’s a pretty fair reflection of how we spend our holiday. There are elements of tradition and there are areas of non-conformity. A nod to the past, a focus on the future. There is a lot of effervescence in my house, a lot of mixing things up, around our holiday table. And that is just how I like it.